Today I was going to make my go to Butternut Squash soup (see recipe here) when I found out that my sweet potatoes were not holding together 🙁 I was determined that sweet potatoes were not going to stop me, so I decided to make a Roasted Butternut Squash Soup instead and boy am I glad I did. 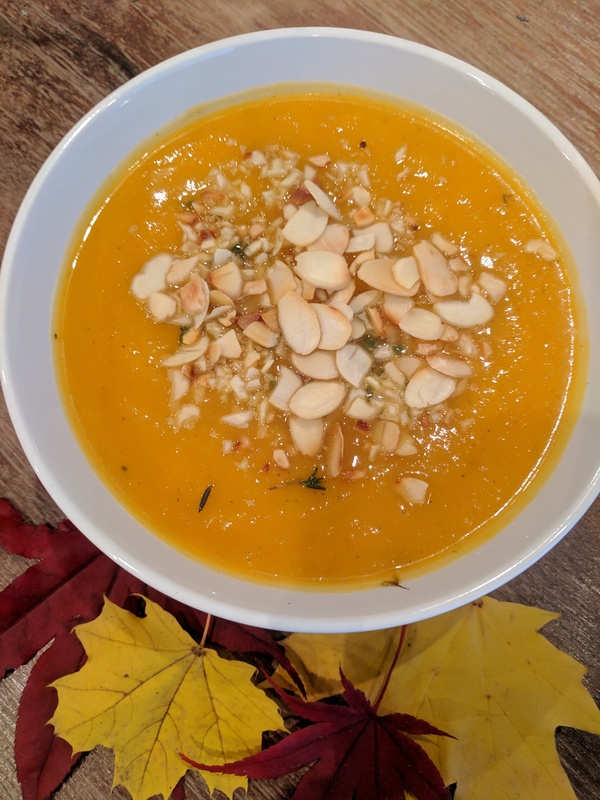 This Roasted Butternut Squash soup turn out really satisfying not only the roasting of the vegetables enhance the flavors this soup is smooth silky and hearty. I decided to top it up with some toasted almonds for some protein bust. Roasted Butternut Squash Soup - Enjoy this delicious soup, perfect for these cold days. In a sacepan place 1tbs of olive oil, fresh thyme add roasted vegetable, vegetable stock, sage, salt and pepper to taste. Bring to boil and simmer for about 10min. Top it up with toasted almonds or yogurt. Give it a try and let me know in the comments below how it turn out. It Looks delicious. I will sure give it a try! !